European Bird Cherry This tree is ‘Mountain Grown’ at Alpha Nursery and is an ‘Idaho Preferred’ Plant. The European Bird Cherry is also known as the May Day Tree. It has its most active growth period in the spring and summer. 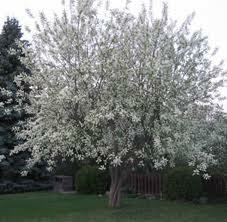 It has green foliage and white flowers, with an abundance of black fruits or seeds that attracts birds and wildlife. The greatest bloom is usually observed in the spring, with fruit and seed production starting in the summer and continuing till fall. Flowers attract bees in the spring. The small fruit that are produced are good for making jams, jelly, sauces and wine. Will preform best when planted in full sun.